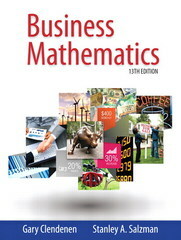 Business Mathematics 13 Edition For courses in business math or the mathematics of business Business Mathematics by Clendenen/Salzman teaches students the mathematical skills they need to be successful in business, emphasizing mastery of business concepts and scenarios that require a mathematical solution. With a strong focus on current issues, real companies, and pragmatic business scenarios, the authors cover the full spectrum of basic business math, placing every concept in context with relevant examples. With time-proven pedagogy, relevant business applications and case studies, and a strong MyMathLab course, this program teaches students mathematical skills and concepts within the context of business applications.